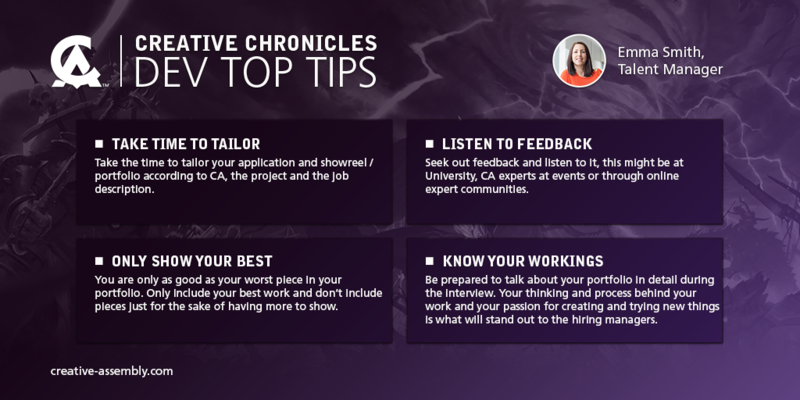 The Creative Assembly annual traineeships are now open to applications for 2019. Programming, which are early opportunities to specialise in areas such as AI, Gameplay and Tools. These positions are highly-sought after entry level roles which we open on an annual basis to support graduates and those looking to start out in the games industry. Our traineeships provide invaluable experience. You will receive mentorship, skill specific training and work closely with our experts across multi-disciplinary teams. Many of our past trainees have, in fact, continued their careers at Creative Assembly into more senior roles. You can hear from some of our 2018 trainees about their application process and their first impressions of life at CA. Grace talks about her first impressions of being a trainee development manager here. If you have missed out on our 2019 Traineeships you can send us a speculative portfolio for other positions, or we will be opening future trainee positions in Spring each year.